One of my favorite colour combinations is pink and rose gold so I thought doing nail art in those colours would be a good idea. I have previously tried nail stamping many times but I’ve never been successful. After a lot of failures, I was finally able to stamp successfully – one nail counts! 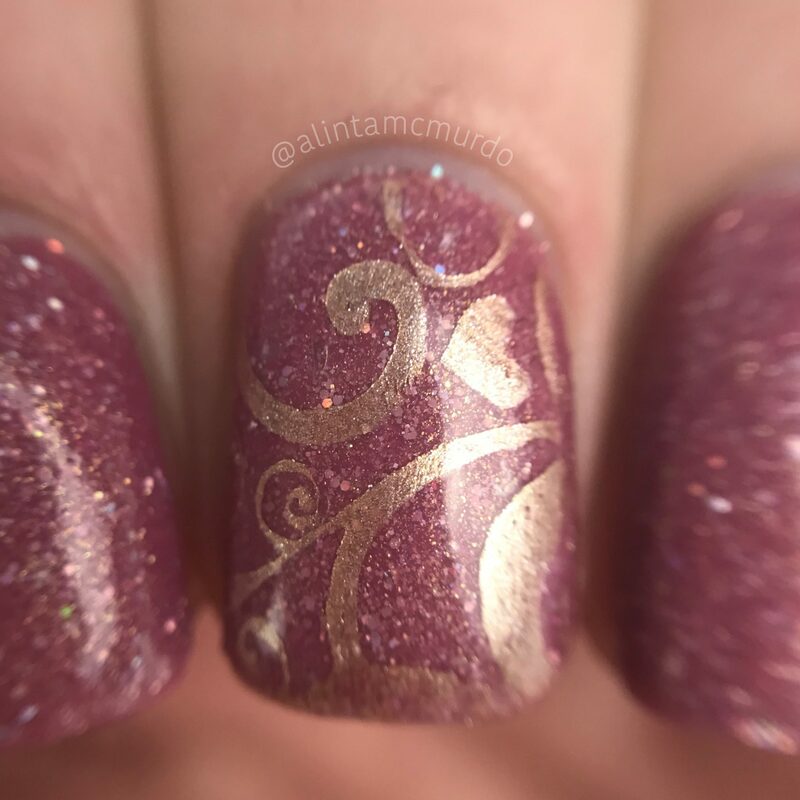 I have shaky hands, so I used my Uber Mat to create a stamping decal for this mani. The nail polish, stamping polish, stamper and stamping plate that I used are all from Emily de Molly. Keep reading to see how I achieved my pink and rose gold nails. For this mani, I used a base of Emily de Molly LE 43. LE 43 is a medium dusty pink with silver holo glitter, gold to green shifting shimmer and a small amount of iridescent flakies. I couldn’t see any of the green shift on my nails but the flakies are visible. This sort of pink is one of my favourite colours and glitter is my favourite finish. It wasn’t as glittery as I was expecting it to be but the glitters can still be seen in most lighting conditions. The formula of this polish is great, it was opaque in two coats and someone without shakes wouldn’t need to do much clean up. If you are like me though, and do need to clean up, the glitters can be really hard to remove from the cuticle area, but that’s typical of any glitter polish. LE 43 is a limited edition polish, so if you like it, buy it while it’s still in stock on the Emily de Molly website. To create the accent nail I used the Emily de Molly Rose Gold Stamping Polish with EDM14 Stamping Plate and a clear stamper with cap. 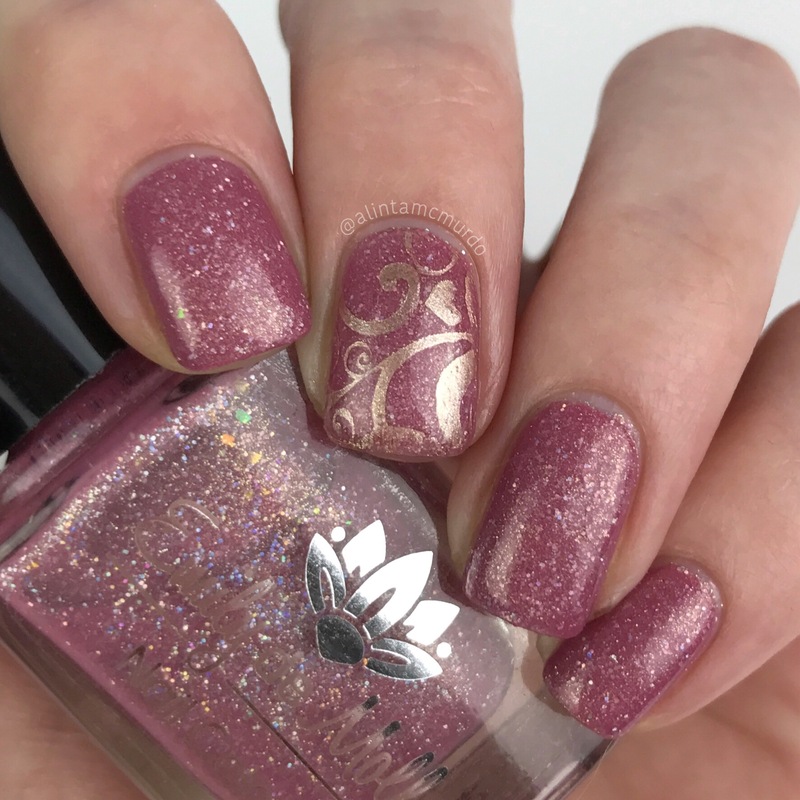 I have previously tried to stamp straight onto my nail but my shakes ruin the design so I decided to try doing a stamping decal using the UberChic Uber Mat. It took a lot of trial and error, I messed up a huge amount of designs before I could get anything useable. I have watched a lot of stamping tutorials but it looks a lot easier than it is. To create the decal, I put a layer of Glisten & Glow HK Girl Top Coat on the mat first – all the tutorials I have watched say to not use a quick dry top coat but I tried a few different normal top coats and they didn’t work as well as the HK Girl. Once the top coat dried, I placed a thick layer of the stamping polish on the plate then very lightly scraped it across the whole stamping design. I then quickly got the stamper and very gently rolled it over the stamping image and then gently rolled it over the dry top coat on the mat – the gentle pressure was really hard to get right, I still haven’t mastered it. I was then able to easily pull the top coat with design off the mat and cut it to an approximate nail size. Then I topcoated my nail and put he decal on. I cleaned up the edges with acetone which also helped to melt some of areas that were sticking up. It’s not perfect, but I am so happy that was finally able to successfully put a stamping design no my nails. 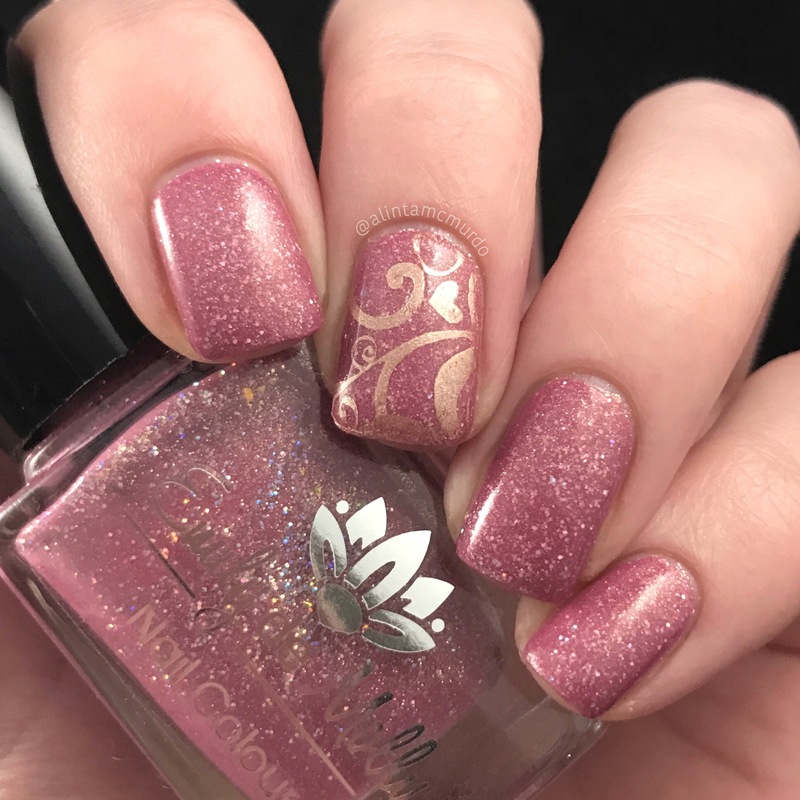 I don’t think I will ever find nail stamping as easy as others do as shakes really get in the way, but I will hopefully get better with time – and not take hours to get one nail done! I want to try more nail art with pink and rose gold or copper, as I love the combination of those colours. 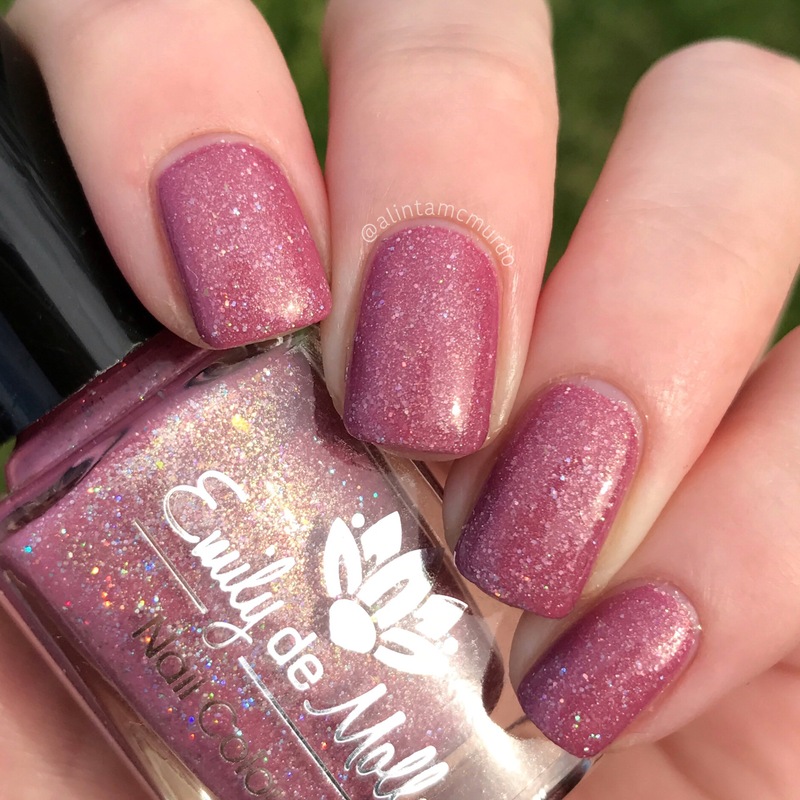 If you haven’t picked up Emily de Molly LE 43, then go get it now, I don’t think it will last too long being a limited edition item. If you want to be updated when I put up new blog posts, then don’t forget to sign up to the email list. Do you like my pink and rose gold nails? Will you be trying this combination of colours? Yes I agree because i have also heard to my clients failing many times before stamping. It is a game of trial and error, these tips will surely help her and I will encourage them to signup for your latest tips via email.